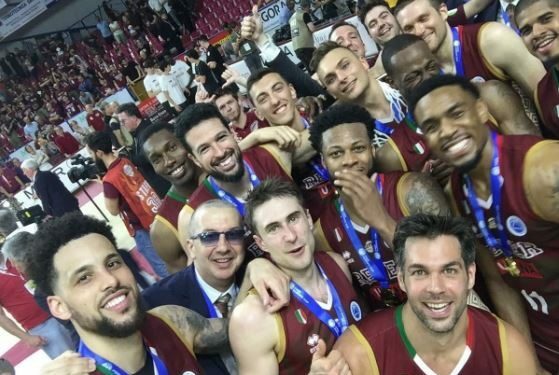 Reyer Venezia defeated fellow Italian side Sidigas Avellino 81 – 79 in the second leg of the FIBA Europe Cup Finals and lifted the trophy after winning the series with a +12 in the aggregate score. Even a loss of seven points would be enough for Venezia that had prevailed 77 – 69 on the road against Avellino in the first Final. Still, in front of their fans, coach Walter De Raffaelle’s players fought well enough to combine the title achievement with a victorious result. Marquez Haynes and Hrvoje Peric scored 16 points apiece while Austin Daye had 15 points plus four rebounds for Venezia. Avellino needed more than the fiery display by Jason Rich (32 points, five assists) and Kyrylo Fesenko’s dominance inside the paint (21 points, 15 rebounds) since the two players didn’t receive much help from their teammates.